Present in 6 California counties. Naturalized in Australia (New South Wales, Victoria) and New Zealand. In the US, present in Washington and Illinois, with an older collection in Virginia along a road. Naturalized in roadsides and stream banks. USDA, Center for Plant Health Science and Technology, Plant Epidemiology and Risk Analysis Laboratory, Plant Protection and Quarantine, Animal and Plant Health Inspection Service (2013). Weed Risk Assessment for Carex pendula Huds. (Cyperaceae) – Pendulous sedge. Present in 6 California counties. Naturalized in Australia (New South Wales, Victoria). Present in Washington. DiTomaso and Healy lists as uncommon escape in wetlands in California. Bikle, B. Wanner (2014). It takes a village… to get rid of an invasive!. Cal-IPC News. 22(2), 4-5. Banned in New Zealand, is on their National Pest Plant Accord list due to its ability to displace species in wetland and its prolific seeding ability. Several thousand plants were removed along a stream in Marin County, CA. The USDA risk assessment found limited evidence of invasiveness and gave it a low score but with a high level of uncertainty. Biosecurity New Zealand (0). National Pest Plant Accord - MPI Biosecurity New Zealand. The areas where it is present in New Zealand do not match California. Several thousand plants were removed along a stream in Marin County, CA, where it spread two miles downstream from an ornamental planting, so it's showing invasive tendencies here. The USDA risk assessment found limited evidence of invasiveness and gave it a low score but with a high level of uncertainty. Numerous other Carex species are listed by Randall 2012 but most references are as naturalized, not necessarily invasive. Carex kobomugi is invasive and on noxious weed lists on the east coast of the US, but not in areas matching California. Checked other references and did not find clear information on other Carex that are invasive in areas similar to California. Medium confidence because there are so many Carex species. Displaces plants along streams. Can form dense infestations. Listed as a prohibited plant in New Zealand for this reason. No specific information so defaulting to no. It can produce dense stands but I do not have enough information to count it as impenetrable. USDA found limited reports of impacts around the world. Grows 1-2 m tall. Reproduces both by seeds and rhizomes. One plant can produce 20,000 seeds with a 90% germination rate. The germination rate is 90%. Seeds are dormant during the cold season but it does not sound like they require an especially long dormant period or special conditions to germinate. Brändel, M. (2005). The effect of stratification temperatures on the level of dormancy in primary and secondary dormant seeds of two Carex species. Plant Ecology. 178, 163–169. From USDA/APHIS WRA question ES-13 (Minimum generation time): "This perennial takes 2-5 years to reach its maximum height (RHS, 2011). Given that, it probably reaches reproductive maturity in 2-3 years. Further, because it is herbaceous, it is highly unlikely to take four or more years to reach reproductive maturity. Based on our level of speculation here, the degree of uncertainty is high." In California, produces fruits from April to June. In Europe, seeds ripen between June and August. Seeds are dispersed primarily by water. Seeds are dispersed primarily by water and it often grows along streams. Seeds are dispersed primarily by water. Seeds do not have obvious adaptations for transport by vehicles. Being an ornamental by itself is not sufficient for a yes answer. 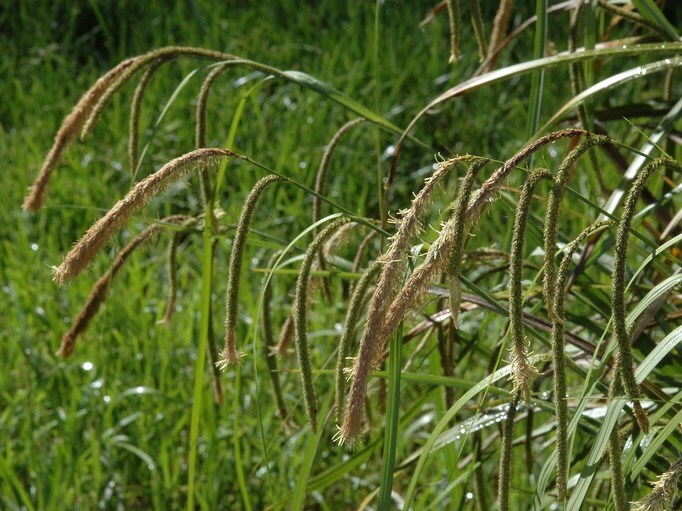 The US Dept of Agriculture Plant Protection and Quarantine program wrote a risk assessment for Carex pendula in 2013 for proposed addition to the federal noxious weed list. Their full evaluation is available under Weed Risk Assessments at https://www.aphis.usda.gov/aphis/ourfocus/planthealth/plant-pest-and-dis.... Their conclusion was Evaluate Further (i.e. no firm conclusion about invasiveness). USDA estimated that 70% of the US is suitable climate for this species and it is likely to invade primarily riparian areas.